We are a team divided, split up into 4 different missions. Mary and Barry are at Chaaria, a mission hospital run by Italian priests. Janelle and Angie are spending the first two days at the Level 4 Mikinduri Hospital, to shadow the clinical officers and help with the well-baby clinics. Peter and Brady met with 3 people with disabilities in the Giithu area, their clients for their engineering project to improve wheelchairs for the hilly, dirt areas around Mikinduri. Keilah went to a poly-technical (trade college) school to have welding students build the charcoal press she and her 3 teammates designed in last year’s UPEI design class. Angie jumped right in taking measurements, giving shots, and recording information to help the nurse she was working with. The language barrier was definitely an issue, as the local language (Kimeru) and the national language (Kiswahili) are more commonly spoken here than English. I saw Janelle hurrying back from our hotel with tweezers in hand to remove a kernel of corn from a 2 year old’s nose. She had been shadowing a hardworking clinical officer (similar to a nurse practitioner), and since there were no tweezers at the clinic, so she had to get her own from her room. The baby girl was held down, screaming, as Janelle went ‘way up there’. The baby let out 2 more screams, realized how much better she felt, calmed down, and then let out a louder scream when she looked at Janelle (She will probably never look at a white person favorably again). Other than feeling bad about making babies cry, it sounds like Janelle had a great day! Both Angie and Janelle were both surprised at the wool snowsuits that the babies wear, in this 30-degree heat! Peter and Brady went to the Giithu area, a very remote poor area, where some of the people may have never seen a white person before (according to the local director Martin of the Mikinduri office). There were a lot of stares for us ‘mazungo’ (white person, and it was a bumpy, crazy road. We were all so impressed our driver Paul was able to travail the 60-degree dirt drop (or at least that’s what it felt like!). Peter and Brady asked questions to three different people with disabilities, to learn more about their likes and dislikes with the wheelchair, in order to better help the people move around. We spoke to Catherine first, a 30 year old who contracted polio at 13 and has since ‘withered’ her hands and feet (that’s the best way I can describe it). Her family was very involved and keen to help her. They lived in a house 8 ft long and 6 ft wide, with wooden slats loosely assembled to let light in, and a corrugated metal roof. There were 3 of these houses together where the extended family lived together, sharing much. We then went to talk to a young boy with cerebral palsy, but his family was no where around. He was left in his house (a similar structure to the last house), surrounded by trees on a steep dirt hill, waiting for his family to return. Sadly, that is a common existence for people with disabilities in Kenya as their family can’t take them with them to the fields or workplace, and they need to raise money. The boy came out and laughed while Peter pushed him up and down the hill in the wheelchair, so the engineering students can have a better idea on what needs to change with the wheelchairs. At the third house, a man in his 20’s born with the disability showed us how he can operate his chair on flat ground, but not on any slope. His family gathered close as well to see what the wazungo (many white people) might do for him. 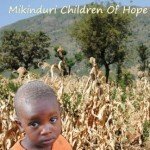 Since we were not there to just hand out supplies, as Mikinduri Children of Hope is more about helping people to learn economic development as opposed to handouts, but we were able to leave them with a picture of themselves. Previously we’d take a picture and show them on the screen, leaving nothing behind, but now that Fuji has a retro-polaroid camera, we can take a picture of each family and give them that photo. It felt like we had left something positive to thank them for their time, without demeaning them. That afternoon, Keilah talked to the polytechnical school about building her charcoal press. The headmaster, an automotive engineer, was eager to talk to all of us and excited that we chose his school to help him. This was a great idea proposed by Martin, Francis, and Lloyd, the main employees of Mikinduri Hope Community Development Organization (MHCDO – the Kenyan sister organization to MCOH). The welding students could not only improve their skills, but they might be able to make more to put in more communities around Mikinduri so that they can turn dried corn stalks into a charcoal fuel source, as the existing fuel source of trees is getting low. We spent the evening in the Mikinduri market, a cacophony of sounds and people whispering or shouting ‘muzungo’ while buying or selling their wares. You feel very popular and very ridiculed at the same time with that phrase. After trying a few shops, (and with the help of the MHCDO board member Petronella), we found what we were looking for: the parts for brakes for a bicycle to install on the wheelchairs, to make going down the hills easier for the people with disabilities (and those pushing them). While Peter and Brady haven’t finalized the designs, we know this will be one important element, and both sets cost only $14. This is the affordable solution we were looking for! When we arrived home, there were appetizers that our amazing chef Ken had prepared for us – Samosas and Spring Rolls. This was just our pre-dinner! For dinner he made a scrumptious lemon chicken. We spent the next few hours reminiscing about our day and trip so far, laughing long into the night. As I sit in bed finishing up this blog, I can see a 4 inch gecko that has come into my room. I started to condemn myself leaving my door open, but then I saw it crawl out the vent above the door, so really I should name him Gary and be thankful I have a new pet. Thank goodness I have a mosquito net! I am optimistic for this trip, so different than the clinics of the past years. We look forward to hearing Barry and Mary’s stories on Friday when they will join us for the weekend. It looks like we’re going to have a lot to do in a short amount of time, and thankfully, the right people are here to do it!